The amazing image below comes from a website featuring Unexpected Motifs in Renaissance Art. 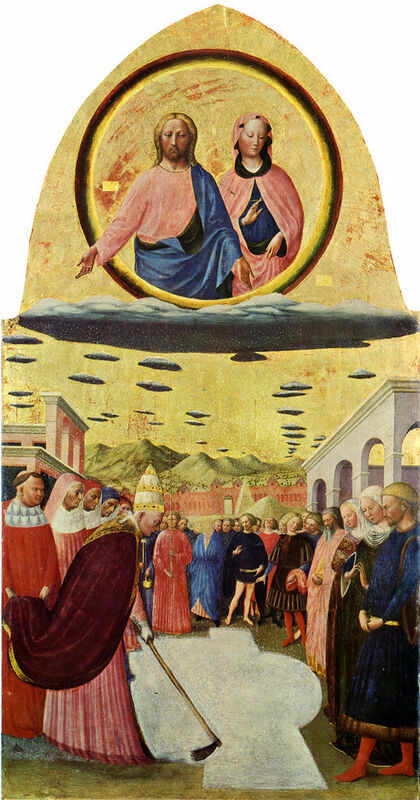 This painting was the central panel of a double-sided triptych Miracle of the Snow made for Santa Maria Maggiore, Rome. The 'UFO-like' clouds are quite an unusual depiction of sky. 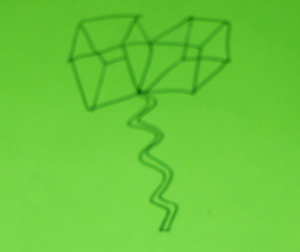 They looked like the glowing outline of a double box kite with a tail like an octupus arm. They moved through the sky as if they were swimming in water! is mythology partially a function of the limitations of language? Mythology is inevitable, it is natural, it is an inherent necessity of language, if we recognize in language the outward form and manifestation of thought; it is in fact the dark shadow which language throws upon thought, and which can never disappear till language becomes entirely commensurate with thought, which it never will. Mythology, no doubt, breaks out more fiercely during the early periods of the history of human thought, but it never disappears altogether. Depend upon it, there is mythology now as there was in the time of Homer, only we do not perceive it, because we ourselves live in the very shadow of it, and because we all shrink from the full meridian light of truth… Mythology, in the highest sense, is the power exercised by language on thought in every possible sphere of mental activity. This page randomly generates "new age" text. In my view, some of it is true despite the fact it's supposed to be a joke. The universe would like you to take a day off. Our promises to you are not taken lightly. We are One in the experience of everlasting life. It is a perfect Icosa-Dodecahedron that encircles the Earth and carries the Paradise Codes. The Infinity Codes are Holographic information packets in the form of light and sound. We ask you to turn within and listen or feel an echo of remembrance. You are crossing over into a new energy, a new perceptual reality. Dear Ones, it will not be too long before we will be amongst you once more. This sentence was Telepathically Communicated by Spirit Eagle. 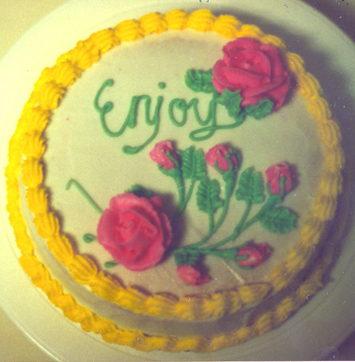 The times we live in could be likened to the baking of a cake. First, you break the eggs - that's a violent act right there. Then, you take a bunch of different ingredients and you dump them all together in a bowl, and you whip the heck out of it. And while you're whipping, when you look at the gooey mess that's in front of you, it's hard to imagine that anything good could ever come out of it. But after you pour it in a pan and add the heat and time in the oven, out comes a beautiful, delicious cake for you to enjoy. It's the same with what we're going through in these times of great change. Almost everywhere you look, people are stressed. Our lives are filled with fear, suffering, scarcity, and deception, and, from the looks of it, you would hardly imagine that anything good could ever come out of the mess we're in. But it can. Indeed, a wondrous new paradise on Earth is in the making, and it is up to us to bring it into manifestation. Today there are 263 stories on Google News about the phenomenon. The problem with WoW is that the whole game is engineered to be addictive and to get you in to a headlock. First of all you've got the point and the level system you have to work through - because we're all fallen sinners we are never content so you start the night saying right I'm gonna get to lvl. 52 tonight, then you get there and it's approaching mid-night and your thinking, well i might as well keep going for a bit to see what the lvl. 52 quests are like and hey presto before you know it your deep into lvl. 52 and you just know you've blown your chances of making it to the library by 9am the next morning! The other thing that makes it addictive and gets you in a headlock the the whole Guild thing. If your in a Guild with say a gang of player around lvl. 50 then you can't take a week or two away from the game because when you get back the rest of your Guild will be deep into the lvl. 60s. You just have to keep playing daily to keep up with everyone else. Vicious circle. I've just been introduced to Subflow.net which offers enjoyable electronic music via online radio! Today's lesson is: when one is working on establishing new habits, it is important to stay loving towards the other people in one's life who are still reflecting the old patterns. While it may be preferable to get away from those people for awhile, it's not always possible, which can also lead to feelings of being trapped. Today I scanned this old photo from High School. I was testing out the autotimer on my 35mm camera. 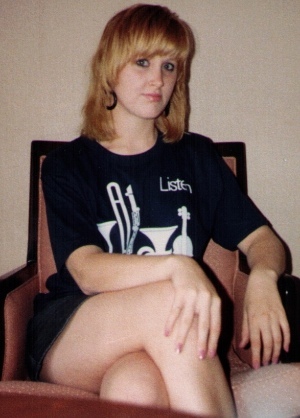 The "listen" message on the t-shirt is a good reminder.